Here’s a clip from Walter’s weekly Chicken Wings Jam at Patrick’s Pub. I’m afraid it’s a bit grainy and dark, but it captures Shaaron Schuemaker on bass and singing that great cover song You Got Me Hummin, along with “Harmonica John” Frazer on harp, Johnny Vernazza on guitar (not sure who other guitarist was), Matt Taylor on drums, Tim Sutherland on keyboard, Chuck Arcilla on the sax, and Phil Lozano on trombone. Summertime jazz is happening again at the Westgate Hotel up on the pool deck, and while this isn’t blues (as a rule), Whitney Shay will be singing there on Friday night before her quartet plays next door later on at the US Grant. 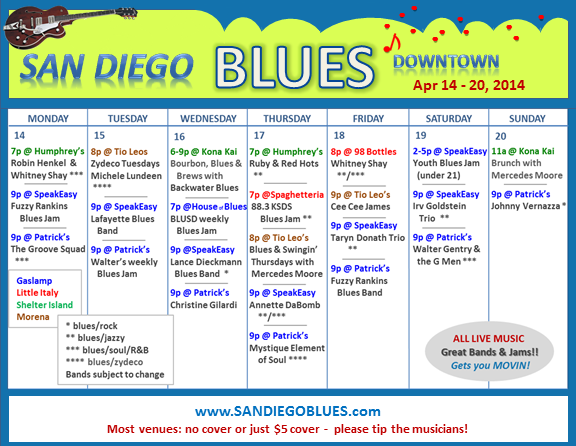 For those of you who love to swing dance to blues… this week we have lots of swinging blues around the downtown. 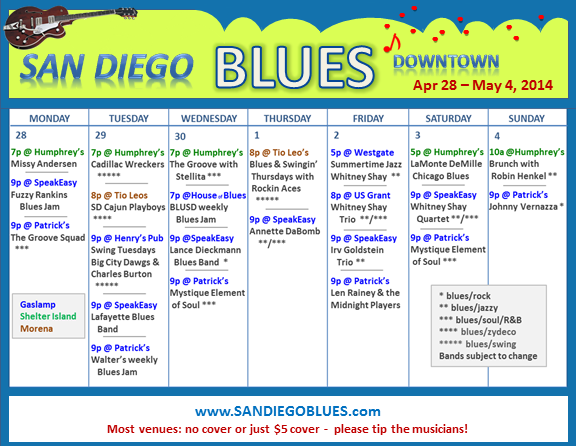 Tuesday night at Humphrey’s and at Henry’s Pub, and Wednesday night at Tio Leo’s. 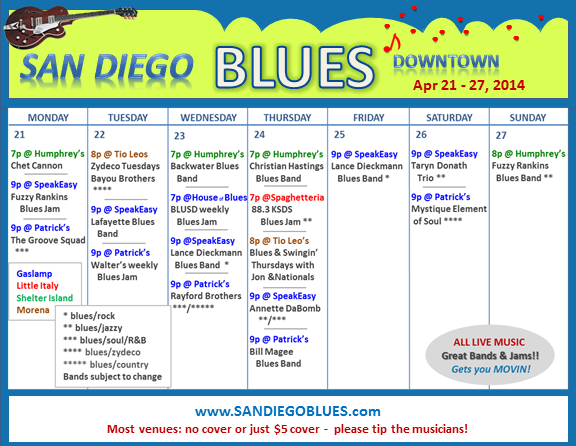 The JammingOut blues jam at HOB on Wednesday nights (7-11p) now features a local band about once a month, and last night it was the Charles Burton Blues Band. This is a fun band with a loyal following of local swing dancers (next Tuesday night he’ll be playing at Henry’s Pub which has Swing Tuesdays, and he’s often at Tio Leo’s on Thursday nights). I’m pleased to finally have video of Charles and some of his band members. Last night they performed a number of songs, including this cover song Stranger Blues, which is on one of Charles’ many CDs. And here is Charles singing his rendition of Sweet Potato Pie, which is also the name of his latest CD. You can hear more sample tunes on the CD by going to TUNES on this site.